Google just made a huge announcement: Exact match keywords can now show for semantic matching queries and not just syntactic matching queries. Google is changing exact match from a syntactic match type to a semantic match type. Let’s take a look at the matching changes and how to analyze and change your account structure. These two words are going to become part of our vocabulary for describing match types. Semantic matching means that the intent of the query matches your keywords. For instance, the keyword [Chicago Plumber] means the user wants to find a plumber in Chicago. So, queries such as: Chicago plumber and plumbers in Chicago have the same meaning. Syntactic matching means you are matching your keywords to the actual query words and not the meaning. For instance, the keyword “Chicago plumber” in a syntactic match would match to “Chicago plumber” but not “plumber Chicago” as the word ordering is different. Exact match: Very close semantic match. Show the ad when the query matches your keywords in the same order; although, the keyword can be expanded to match words before and after the inclusion of the keywords in the user’s query. Show the ad when the query is similar to the keyword. Is “Wedding cakes” similar to “Birthday cupcakes”? They are both event based pastries that must be baked. You could argue that the semantic is similar even though a user searching for wedding cakes probably isn’t going to buy birthday cupcakes. Broad match modifier: Limit the semantic expansion for some words in your keyword phrase to only show for close semantic matches and not similar semantic matches. [Chicago to Seattle Flights] should not match to Seattle to Chicago flights. The to and from cities in the query are different and therefore the user intent is different. [Licensed plumber] should not match to plumber license. One intent is to find a licensed plumber to fix or install something. The other is for a person trying to obtain their license. [Table & Lamps] should not match to table lamps. One query is looking for multiple products, the other is a specific product type. Google has done a lot of analysis on these types of semantic searches and should not be showing your exact match queries in these types of instances since the searcher’s intent does not match your keyword’s intent. The biggest concern is that Google might not understand that changing the word order or adding/removing stop words changes the user intent in all circumstances. This is when you really need to watch your data. We already see the occasional case where a singular versus a plural word can make a huge different in the data. When that happens, it creates scenarios where you should manage singulars and plurals separately. This change can further change how you use negative and positive keywords together to determine your bids and ads for specific queries. Let’s look at how to manage these changes. In your search query data, these new matches will still be called ‘close variants’ under match type. Odds are, once the change happens, you will see an increase in the number of exact match close variants in your account. 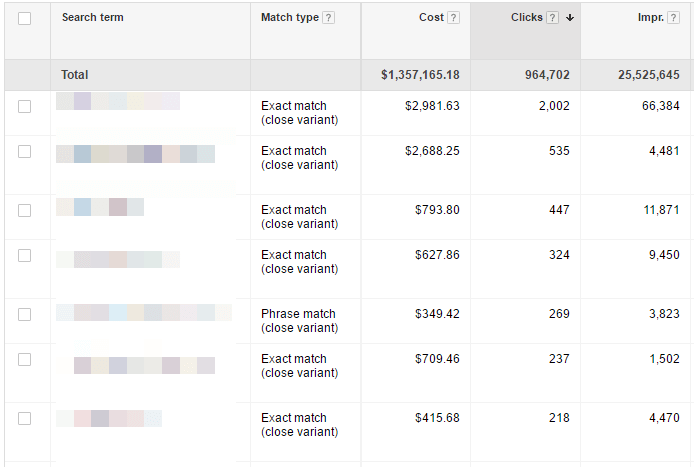 For example, in this account when the word from appears in a search query (and it’s appeared in 181 different queries) they have spent $889 for 4 conversions. Their typical cost per conversion is around $15. 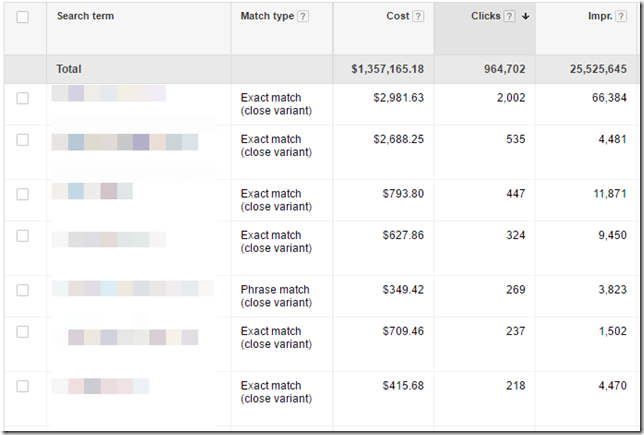 When the word from appears in the query their cost per conversion skyrockets to $222. Therefore, they should add the word from as a negative keyword so they don’t show for this variation anymore. In other accounts, you will see these new matching words will perform similar to your current exact matches, so you might not add a negative keyword and leave it as it is. In many ways, this is the most frustrating part of the change for me. With the new exact match, technically, you can add just the term [Chicago flights] and show for all the variations. However, you never know if Google is going to expand and reorder your variations since if the semantic matching is not the same, they will not reorder the words; therefore, you still should add them all. The purpose of a keyword is to determine if you should show an ad, which ad to show, and to set a bid for a click. The ad is the marketing; the keyword is just the targeting. However, you do want to control when your ads show and to ensure you are showing your best ad for any search query. The changes to exact match will change when your ad shows. Ensure that these changes aren’t negatively affecting you by using n-gram analysis. And as always, ensure you are testing your ads to make sure your best ad is always showing.